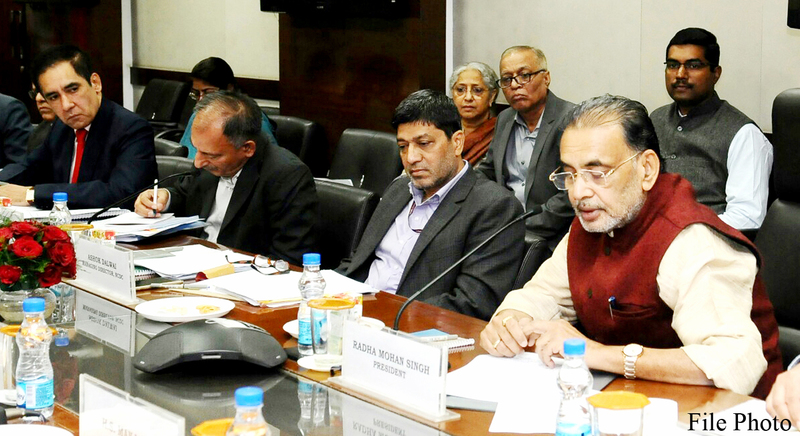 Union Agriculture Minister Radha Mohan Singh presided over the General Council Meeting of National Cooperative Development Corporation held in Krishi Bhawan on Wednesday in the backdrop of NCDC’s remarkable growth of business in the recent years. General Council expressed satisfaction with the activities of the cooperative corporation. “No doubt, Radha Mohan Singh-the concerned Minister deserves a pat for making an otherwise inflexible organization respond to the people at the grassroots level approaching it for loans”, said a few members of General Council to Indian Cooperative. No wonder, NCDC has grown from strength to strength after the NDA govt came into power. While it has given loan only to the tune of Rs 4000 crore till 2015, it has gone up six fold just in the last three years touching a figure of Rs 24000 crore. NCDC has also brought about a change in its attitude in recent years. It not only gives loan to a cooperative but also hand-holds it through the whole procedure, claimed its Joint MD Thakur. “Why should anyone take loan from us, it is the quality of service that goads co-ops into approaching us”, Thakur underlined. Singh said during the current financial year 2017-18 the NCDC not only continued its excellent performance but also made a record surpassing its annual target in the first 6 months. It sanctioned Rs. 25270 crore and disbursed assistance of Rs.15915 crore. Singh went on to say that in the last three years the Corporation also registered a growth of 254% in releasing its financial assistance to cooperatives. The funding rules of NCDC were so stringent earlier that it gave loan to an individual cooperative only when the state govt stood guarantee for him. Given the excessive bureaucracy, it is no wonder the NCDC inevitably failed to reach out to the needy. But all that has changed, said Thakur; we only assess the viability of an idea before deciding upon our next move. Besides the Minister and the NCDC officials, Sahakar Bharati officials including its patron Satish Marathe and IFFCO MD Dr U S Awasthi also participated in the meeting. NCUI was represented by its CE N Satyanarayan. In recent times, NCDC has started to work on the lines of participatory management drawing heavily on the ideas of Sahakar Bharati. It upgraded the NCDC Training Institute at Gurugram as a national level institute and renamed it as Laxmanrao Inamdar Academy for Cooperative Studies and Human Resource Management. It has also launched another ambitious programe named Sahakar 22 in which it aims to strengthen co-operatives in 222 districts. Despite improvements in its working NCDC still has a long way to go. There was not an iota of information related to Thursday meeting on its website which still carries the picture of women conference held last year when Vasudha Mishra was the MD. Its current MD Sundeep Kumar Nayak is a little too official with a trace of self-importance to respond to fax or mail for every small query from the media. That is to say, he is invariably at work stonewalling queries about his organization and its activities.